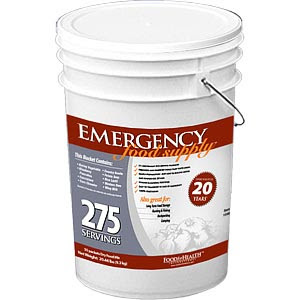 Emergency Food Supply - 275 servings for less than 100USD? Basic preparation will impact the probability of your family’s survival in an emergency. Delicious and easy to prepare. Each bucket contains 275 servings of pre-mixed and pre-seasoned 100% vegetarian and vitamin fortified food. With a 20 year long shelf life, this kit is perfect for the preparation of natural disasters such as hurricanes, tornadoes, earthquakes or even for a camping or hunting trip. The Date of Manufacturing is printed on each individual packet. The Expiration Date for all the food is printed on a sticker on the outside of the bucket.